Now archived! Presentation from the PolarConnect event with George Hademenos and the team working with the Antarctic Automatic Weather Stations in Antarctica. You can access this and other events on the PolarConnect Archives site. Carol Costanza helps recover Laurie II AWS. Photo by Elin McIlhattan The Antarctic Automatic Weather Station (AWS) network has been making meteorological observations since the early 1980s. This continent-wide network is positioned to observe significant meteorological events and increase our understanding of the climate of the Antarctic surface. Researchers utilize the AWS network to observe and learn about the Antarctic in a warming world. Given the duration of the AWS program and maintaining AWS sites for many years, numerous studies have been conducted on the surface climatology of regions of the continent, such as the Ross Ice Shelf. This climatology also aids in other studies, like winter warming events. The Antarctic Automatic Weather Station network provides a greater understanding of the surface meteorology and climatology throughout the continent of Antarctica. The AWS network spans the Ross Ice Shelf, Ross Island, West Antarctica, East Antarctica, and the South Pole. Since some of the AWS have been working for over 30 years, we can begin to understand the climate over many regions of Antarctica. 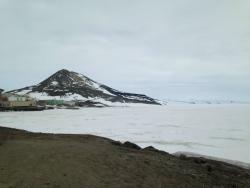 View of McMurdo Station from Hut Point. Photo by Carol Costanza Based at McMurdo Station, Antarctica, the team will travel to remote locations to install, fix, and remove Automatic Weather Stations. These locations vary from the Ross Ice Shelf, Ross Island, West Antarctica, and the South Pole. How Does Weather in Antarctica Impact Me? George Hademenos is currently in his 16th year of teaching physics at Richardson High School in Richardson, Texas (a suburb north of Dallas). He was awarded a BS degree in Physics from Angelo State University and the MS and PhD degrees in Physics from the University of Texas at Dallas. He lives in Richardson with his wife Kelly who recently retired as a classroom teacher. They have a daughter, Alexandra, who graduated from Angelo State University with a degree in Elementary Education, and two fur babies: Atticus and Jane, rescues from the local animal shelter. As a teacher, George is always on the lookout for innovative approaches and creative resources to help bring science and STEM alive for students in his classes as well as assisting teachers in his district. He is beyond excited to be selected as a participant in the 2017-2018 PolarTREC cohort and looks forward to meeting and collaborating with his research team about the work to be conducted during the expedition in Antarctica. Carol Costanza is an Associate Instrument Technician at the Antarctic Meteorological Research Center at the University of Wisconsin-Madison. She works on the Automatic Weather Station (AWS) project and has deployed to Antarctica four times. The AWS project was started in 1980 and currently maintains a network of about 60 AWS across the continent. Carol’s work focuses on the data processing and data management of the AWS data. So enjoyed all the articles sent to me about the Antarctic from Grandson Doug Rhoades.!! !